Yoga Behind Bars has offered yoga classes to prisoners for a while. Now it’s teaching inmates at the women’s prison near Gig Harbor how to lead classes themselves. But their uniform gray sweats and the loops of concertina wire visible through a bank of high windows are a constant reminder that we’re in a prison. I’m doing down-dogs in a Yoga Behind Bars class at the Washington Corrections Center for Women near Gig Harbor. And while the class opens with practicing some yoga, the rest of the day of training will focus on how these women can teach yoga to other inmates. 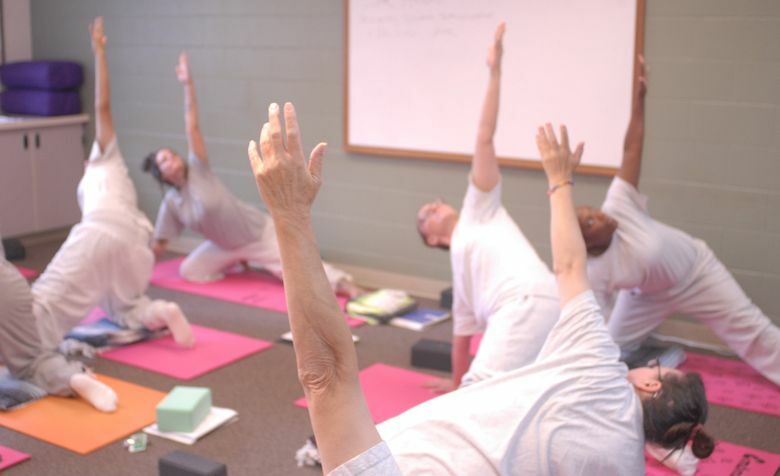 The Washington nonprofit, founded in 2008, has been providing yoga classes to incarcerated people for years by sending specially trained teachers into prisons. But the organization recently started offering teacher trainings as well. This one, the first for women prisoners, is halfway through a six-month course. “The people who know best what tools are needed to serve incarcerated people are those who are incarcerated themselves,” says Program Director Jess Frank. “Not only will it give them incredible tools while they’re incarcerated, it’s also a way for them to have … a part-time job” upon release. What’s more, Frank, who has worked with formerly incarcerated people and is a yoga teacher herself, hopes the trainings will help yoga reach more prisoners. “So of the 18,000 folks incarcerated in the state on any given day, we’re serving 3,000 people per year,” she says. Candace Ralston, an inmate and a teacher in training, knows well how hard it can be to get into a class. Ralston says yoga taught her to relax and find a “calm within.” She’s training to be a teacher because she wants to “give back” and help others find that calm. Frank explains that, while not everyone in prison has post-traumatic stress disorder, prison is often a stressful environment, and many incarcerated people have experienced past traumas. Frank says symptoms of lingering trauma, such as hyper-vigilance, trouble sleeping, short tempers and overblown reactions are common among inmates. And yoga, with its emphasis on meditation and physical and mental integration, can help. Students in the training I observed seemed to agree, alternating between offering examples of such behavior and scribbling notes on how to tailor their teaching for victims of trauma. “I have never been around so many people (who) when you smile at them, they don’t smile back,” says one trainee. “Because of yoga, I do feel safe, I feel empowered and the ‘fight or flight response’ is not so bad,” says another. This isn’t yoga as a luxury pastime. This is yoga for survival. And Frank believes this “quality of being” can help prisoners once they’re released, as well. “Ninety-seven percent of these folks who are getting out, ultimately they’re going to be our neighbors. They’re part of our community,” says Frank. She says yoga can help with successful employment, addiction recovery and even parenting. “If someone is going to decide to do something that makes your family or community unsafe, wouldn’t you rather they know how to take a moment and breathe?” she asks.